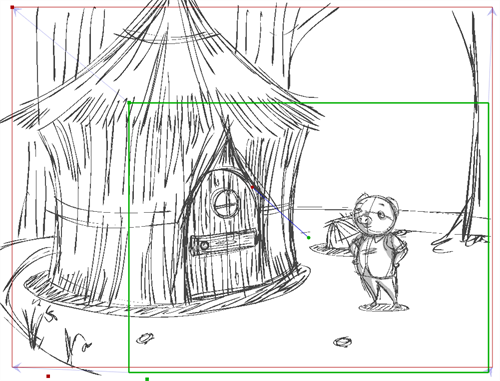 In order to create any animated camera for a scene, you need at least two keyframes. Create these keyframes before you change the position of the camera if you plan to move it. Select Camera > Add Camera Keyframe at Current Frame. A keyframe is added in the Timeline view at the exact position of the red playhead. In the Timeline view, select the panel on which you want to add a keyframe. ‣ In the Tools toolbar, click the Camera tool. ‣ Select Tools > Camera. ‣ Select Camera > Add Camera Keyframe at Beginning of panel. ‣ In the Tool Properties view, click the Add Keyframe at Beginning of Current Panel button. In the Timeline view, a keyframe is added at the beginning of the selected panel. ‣ Select Camera > Add Camera Keyframe at End of panel. ‣ In the Tool Properties view, click the Add Keyframe at the End of Current Panel button. A keyframe is added in the Timeline view, at the end of the current panel. In the Timeline view, click to select a camera keyframe. In the Stage view, click the camera keyframe. ‣ Select Edit > Copy Camera Keyframes. ‣ Press Ctrl+C (Windows) or ⌘+C (Mac OS X). ‣ Select the Camera tool. In the Tool Properties view click the Copy Camera from Selected Panels button. Move the playhead to the position within the same scene where you want to paste the keyframe. ‣ Select Edit > Paste Camera Keyframes. ‣ Select the Camera tool, and in the Tool Properties view, click the Paste and Fit Camera on Selected Panels button. NOTE: You can copy/paste several keyframes simultaneously if you selected multiple keyframes before performing the operation.